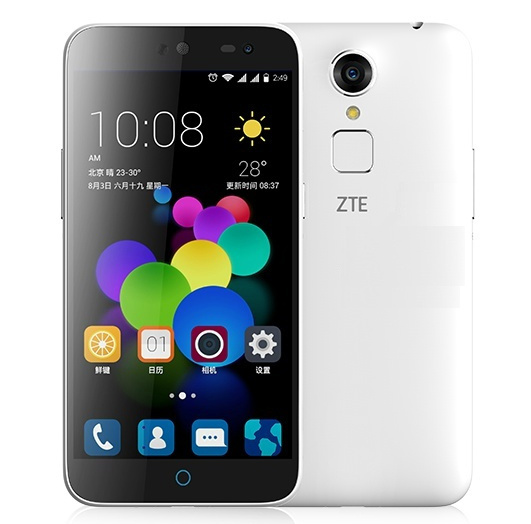 Zte blade A1 Gsmarena ZTE this week officially announced the Blade A1, a very affordable smartphone with a rare feature for its class. The handset has a fingerprint scanner on the back – we’ve never seen a sub-$100 smartphone to have this, and, since the Blade A1 will cost just $94 (599 CNY) in China, it can be considered the cheapest smartphone to feature a fingerprint reader. According to ZTE, the fingerprint sensor of the Blade A1 can unlock the device in 0.3 seconds, so it should be quite fast. For now, we can’t test this, as the new handset isn’t available to buy yet. It will go on sale later this month via JD.com (one of China’s largest online retailers), which is already accepting reservations. Fingerprint scanner aside, the Blade Z1 is a pretty modest plastic-made smartphone. It comes with a 5-inch 720p display, LTE, dual SIM support, a 13 MP rear camera, 8 MP front-facing camera, 2 GB of RAM, 16 GB of expandable storage space, and a 2800 mAh battery. The handset runs Android Lollipop (customized by ZTE), and is powered by a quad-core MediaTek MT6735 processor clocked at 1.3 GHz. At the moment, we don’t know if the ZTE Blade A1 will be released outside of China. If it will, it’s probably going to be a little bit more expensive than in China, though it should still be very cheap.